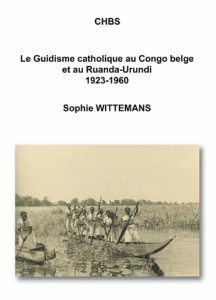 This essay outlines the pedagogical and chronological framework of the catholic guiding movement in the Belgian Congo and in Ruanda-Urundi. Present from the years 1923 on the shores of Lake Tanganika, it will essentially be implemented since 1937 by Madeleine Vilain XIIII from the Katanga province. After a short South-African contact and experience during the second World War, the expansion of Girl-Guiding will be exponential in the 1950s. From 1955 onwards, Marie-Claire Laloux and Marie-Jos&egrave;phe Lacroix will worry about its durability and try to consolidate both its structure and pedagogies, on site and from Belgium. Designed as a movement for black girls right from the start, Girl-Guiding will attempt to adapt as much as possible to the Congolese reality, but will be penalised by the difficult starting position of girls and women in the Congo. It is only at the very end of the 1950s that the torch will be passed to Congolese leaders.